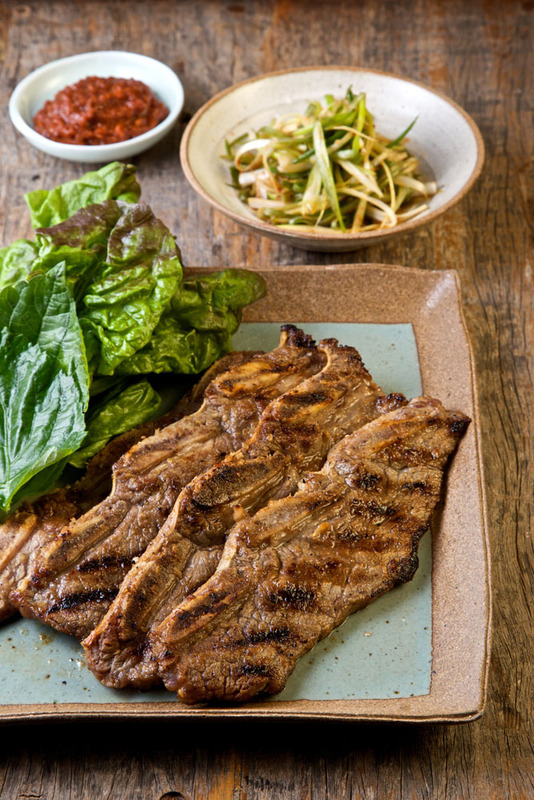 It’s not entirely clear why this version of galbi (short ribs) is called LA Galbi, but the general consensus is that it’s because the meat for galbi is cut differently in Korea than it is in America—specifically in LOS, which has the largest concentration of Koreans in this country. “LA-style” short ribs are sliced thin, which allows the marinade to really penetrate; they are also cross-cut so that each slice includes a bit of bone, which, incidentally, makes for a nice little handle. It’s typical to make ssams, or wraps, by rolling the grilled meat in lettuce leaves with some spicy peppers and a bit of ssamjang—a Korean condiment that’s essentially a mix of gochujang (red pepper paste) and doenjang (soybean paste) If you want to be really Korean, use scissors to cut the cooked meat off the bones. Rinse the short ribs being sure to brush off any fragments of bone that might remain. Pat dry. 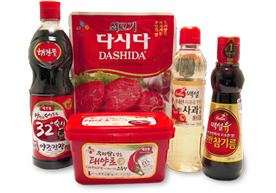 Combine the onion, pear, garlic, ginger, sugar, pepper, soy sauce, soda, and soju in a blender and puree until completely smooth. Transfer the mixture to a bowl, add the short ribs, sesame seeds, and scallions and turn to coat with the mixture. Cover the bowl and marinate in the refrigerator overnight. Preheat a grill to high or preheat a ridged cast iron grill pan over high heat. Remove the meat from the marinade. Grill the galbi until cooked through and nicely caramelized on both sides, about 1 1/2 minutes per side. Transfer to a large platter along with the ssam fixings and wrap away. Note: If you can’t find “LA-style” short ribs, ask your butcher to thinly slice short ribs for you.